A 25 year old bicyclist was fatally struck by a hit and run truck driver in NYC. Aurilla Lawrence was fatally hit by a gas tanker truck near the intersection of Broadway and Rodney Street in Williamsburg last Thursday night around 11:30 pm. The driver fled the scene of the accident and so far is still at large. Lawrence was a beloved member of the bike messengers community who nicknamed her “Aurilla Gorilla”. 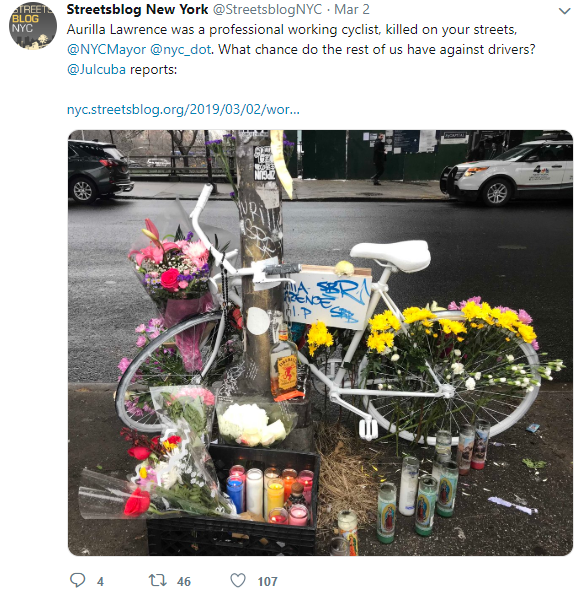 Last Sunday around 200 bike messengers and street safety advocates organized a memorial ride on the streets of New York to commemorate the victim. Bicyclists met at Lenox Avenue in Harlem and rode their bikes South on Fifth Avenue toward Union Square. The Union Square Park is an area where Lawrence used to hang with fellow bike messengers in between deliveries. As a tribute to her, the bike-a-thon made a stop at the park and participants raised their bikes to her memory. Then the 200 cyclists continued their way toward Brooklyn. They crossed the Williamsburg bridge to ultimately arrive at the location of the accident where a ghost bike and a makeshift memorial were installed. The participants gathered around the memorial and paid tribute to their beloved co-worker. 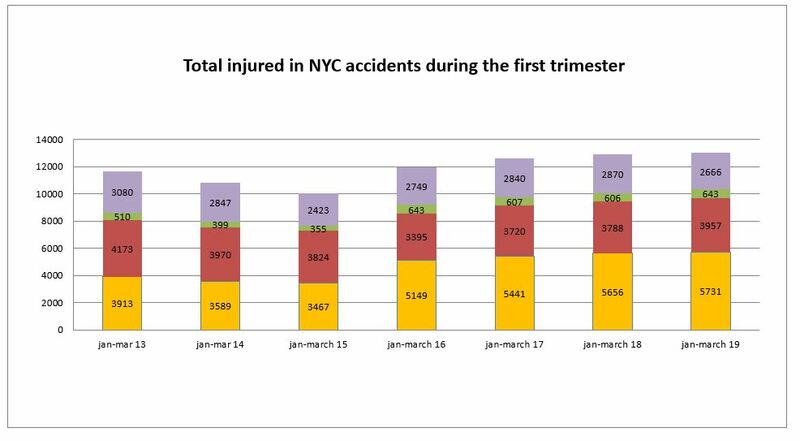 For the third consecutive years NYC auto accident injuries in January stayed above 4,000. 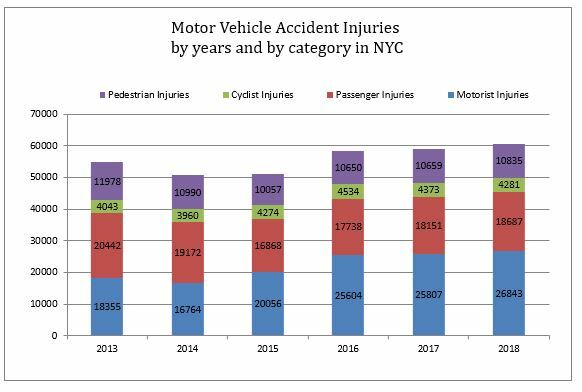 4,347 people were injured in motor vehicle accidents in New York City in January compared to 5,361 in December 2017 and respectively 4,351, 4,383, 3,624, 3,449, 3,899 and 3,993 in January 2018, 2017, 2016, 2015, 2014 and 2013. Pedestrian fatalities increased by more than 40% in January 2019 compared to January 2018. However the number of pedestrian fatalities was still half what it was before Vision Zero started. 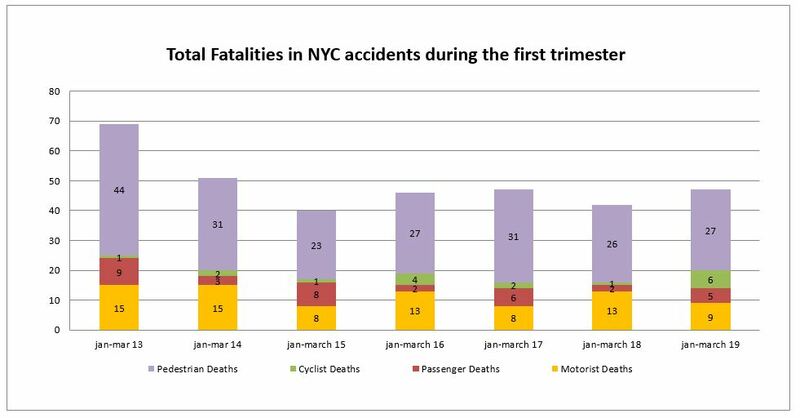 10 pedestrians died in traffic accidents in New York City in January 2019 compared to 7 in January 2018 and 20 in January 2013. A month before in December 2018, 16 pedestrian died in traffic fatalities. The period covering October November December and January is the most dangerous for pedestrians because the sun goes down a little bit after 4 pm and pedestrians become less visible by motorists during the rush hours. The city is running preventive campaigns to raise awareness about this problem. It looks like the campaign was more effective last year than this year as monthly pedestrian injuries never went above 10 during the entire period of October November December and January. This year, except for October monthly pedestrian fatalities were back above 10 during the fall and winter months. 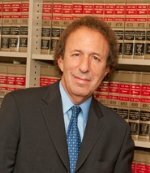 NYC Motor vehicle accidents injuries reached a record high in 2018. 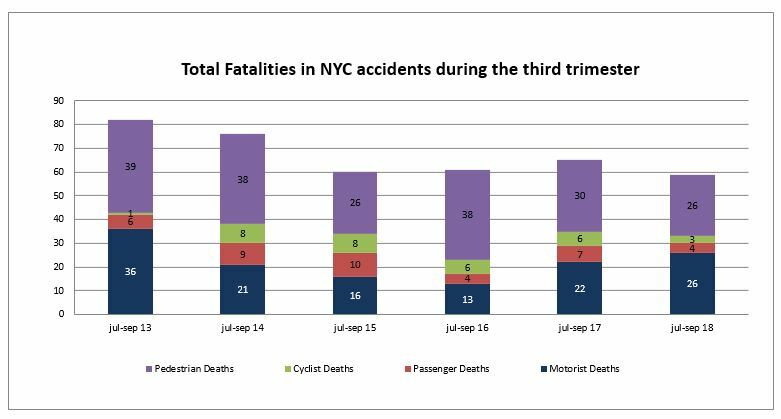 1,083 pedestrians, 4,281 cyclists, 18,687 passengers and 26,843 motorists suffered personal injury in a crash in New York City in 2018. 60,646 people were injured in NYC traffic accidents in 2018 compared to 58,990 in 2017 and 54,818 in 2013. Over the last five years the number of traffic injuries increased by more than 10%. The main reason for this increase are motorists injured in auto accidents often related to distracted driving. Distracted driving is the number one cause of crashes in New York. 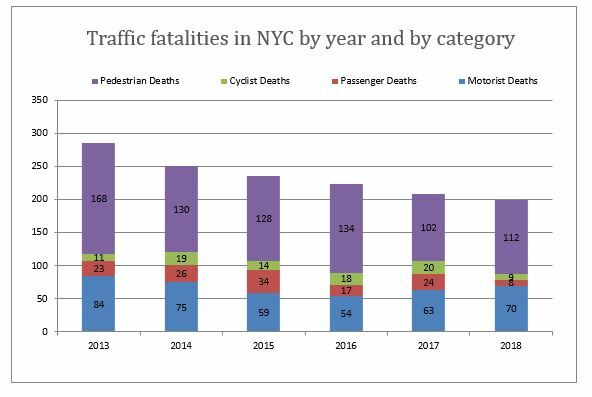 The total number of traffic fatalities in New York City in 2018 was below 200 for the first time since Vision Zero was implemented. 112 pedestrians, 70 motorists, 9 cyclists and 8 passengers were killed in traffic accidents in the city in 2018. Annual traffic fatalities declined by more than 30% since 2013. The total number of crashes in the city has been culminating above 227,000 for the last 3 years with a record 227,924 accidents in 2018. Driver inattention is the primary cause of accidents followed by driver following too closely. Backing unsafely and changing lanes unsafely are two other common causes of accidents in the city. Since 2013 auto accidents increased by 12%. On Wednesday, at a hearing on four e-bike and e-scooter bills Mayor de Blasio and DOT Commissioner Polly Trottenberg indicated that they were not in favor of immediately legalizing the usage e-bikes and and e-scooters. According to them, they are too dangerous and can lead to additional pedestrian and regular bicycle accidents. Polly Trottenberg said that the DOT had two e-scooter fatalities on record. She also added that New York State should be first to legalize this mode of transportation. 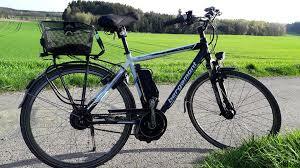 However Governor Cuomo recently indicated that localities should be in charge of deciding whether or not they want to legalize e-bikes and e-scooters. Despite being illegal the usage of e-scooters and e-bikes has been increasingly popular in the city especially among delivery workers. On Wednesday, many of them were present at a press conference held outside of City Hall before the City Council hearing on the bills. Delivery workers who are using them for work are fed with paying for tickets that can go up to $500 or have their vehicle confiscated. They want the city to legalize this new mode of transportation as soon as possible. Last year the NYPD confiscated 1,215 e-bikes and distributed 1,154 tickets for using e-bikes. Additionally 1,362 moving violations were issued to e-bike riders during the same period. For a delivery worker the amount of a ticket can be equivalent to a week of work. 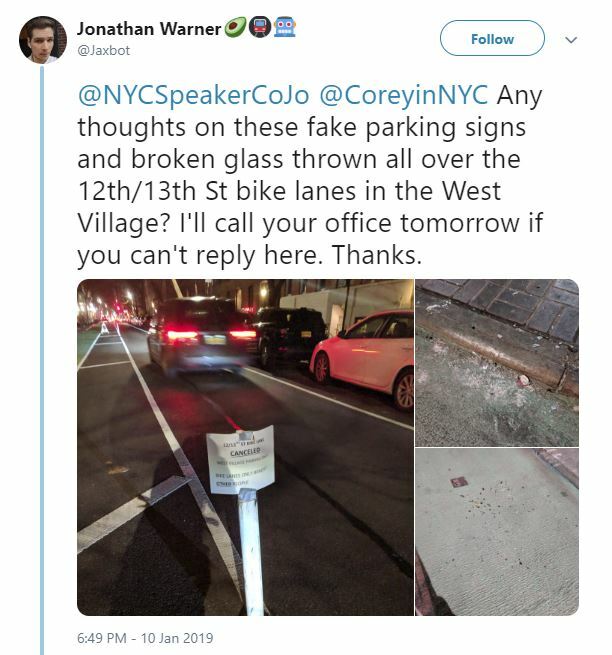 Anti bike lanes activists intentionally put NYC cyclists at risk of dangerous accidents by spreading broken glass on the 12th and 13th streets bike lanes in the West Village in Manhattan. This is the second time that a bike lane has been intentionally vandalized for political reasons. In November, thumbtacks were thrown all over the 43rd Avenue bike lanes in Sunnyside, Queens by bike lanes opponents. Yesterday afternoon, “bring back our parking!” graffiti and other anti-bike lane signs appeared on the 12th and 13th street bike lanes. Broken glass was also spread over the two bike lanes putting cyclists at risk of dangerous accidents. According to Street Blog, the graffiti reflect the opinion of the anti-bike lane 14th Street Coalition. This group is asking the city to remove the two bike lanes on 12th and 13th street as well as the bus lane on 14th street. The two bike lanes and the dedicated bus lane were implemented by the city in anticipation of the L subway lane closure. Now that the city announced that the L will not shut down, some anti cyclists neighborhood groups want their their street back to the way it was before. Our NYC bicycle accident lawyers are suing the city and the Hudson River Park Trust on behalf of the families of the victims of the terror attack that took place a year ago on the West Side Highway bike path. Our firm is representing the families of 20 victims who were among the people who were killed or injured by a pro-ISIS terrorist who rented a truck from the Home Depot and sped down the Greenway, a popular bike path along the Hudson River, mowing down anyone in its path.